Ask and ye' shall receive. My brother in law is staying with us for a few days and he said that he had to get his wife a birthday card. No need to buy one, I can whip one up in no time! Plus I wanted to make a card for Splitcoast's weekly sketch challenge. The sketch this week is a great one, just perfect for CAS cards. You can find this week's sketch here if you'd like to play along. My card was real quick and easy to make, I simply stamped my image and colored it using my SU markers. I used my white gel pen for the center of the flowers and I stamped and cut out one additional flower for the exclamation point in my sentiment. I didn't have any pink ribbon, so the pink ribbon on my card was colored using my SU markers. My green ribbon was a piece of scrap that I had left over. Adorable! Love that penguin!! Great ribbon work!!! Patty, this card is so fun! I love the colors and the image...and all the ribbon! Fantastic! So cute! Love that you used one of the flowers as the dot on the exclamation mark. What a fun image, and such a cute, happy card. Love your take on the sketch and your wonderful colors and design. 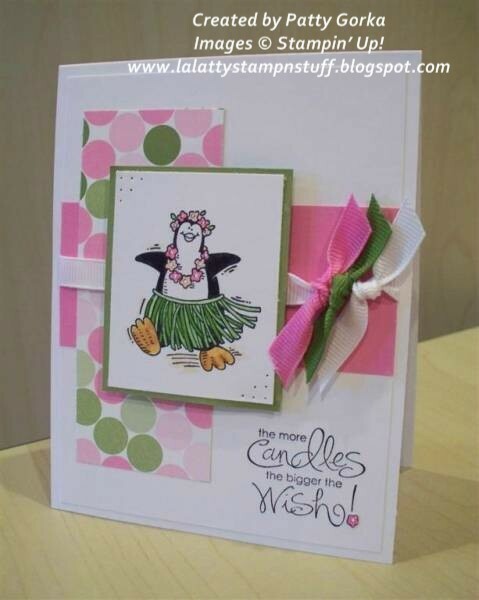 Love the layout Patty - it is super fun with the color scheme that you incorporated!! Great work and thanks so much for sharing!!! so cute patty! i love the penguin, you did a wonderful coloring job!! what a great birthday card, so whimsical and fun.